I know, this is very long overdue, but it's here! It’s time for camp! Finally, I got out from class (which was half-empty anyway) and took my bags. I was so excited that I tired myself out, with all the packing and what not! After slight confusions with the rendezvous, we finally got to the Co-curriculum Arena. 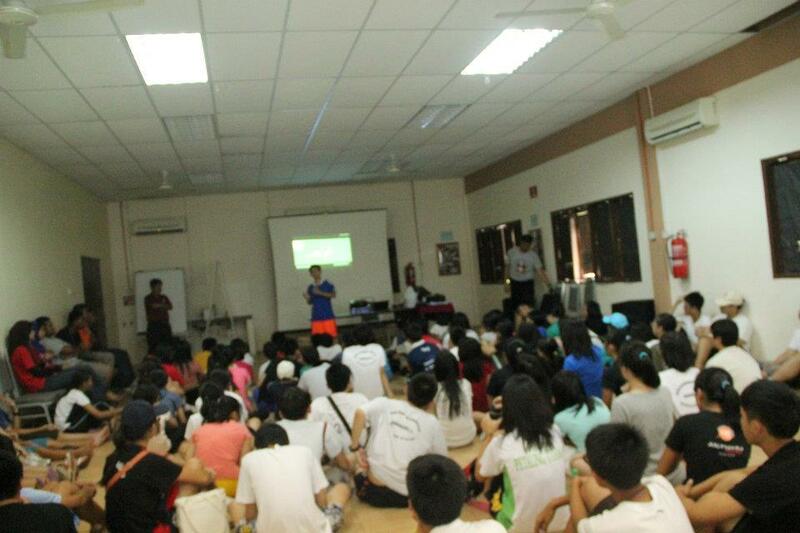 It was pretty jam-packed with buzzed campers eager to leave for camp! Did some registration, waved goodbye to friends and off we go! Finally I got on the bus with the others. Chatter was widespread, like a pandemic. After everyone was up, it was time to hit the road! I got some easy listening as I lull myself to sleep with the rocking of the bus…. Three words: I can’t sleep! The buzz still hasn’t worn me out. Somehow, our bus got lost in the limbo between Negeri Sembilan and Melaka. Even so, every cloud has a silver lining, the clichéd always say. I got to see the opulent beaches of Port Dickson and the rustic hamlets in rural Negeri Sembilan. 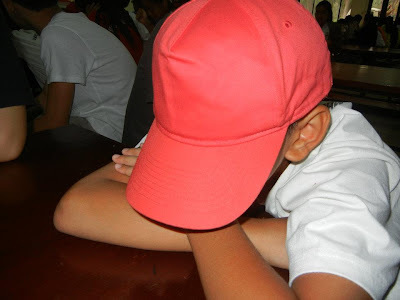 I was by then humming to myself to the buzz charging in the campers’ aura, and was trying to get a few winks of sleep. Finally, we have reached camp. Linggi’s the word as we got our luggage and had lunch at the cafeteria. Pretty quaint place, I’ve got to admit. Serving time is the all-too-out-of-place Major Chris, who smiled at me with warmth. I don’t know what to make of this, but we’ll see, and let me enjoy my lunch. Sitting under my dormitory, bashing in the failing golden sun rays; we have gone through the ice-breakers and let me recollect what we’ve been going through. After the introductory briefing, Major Chris got us to do a personality test, to see our strengths and weakness. 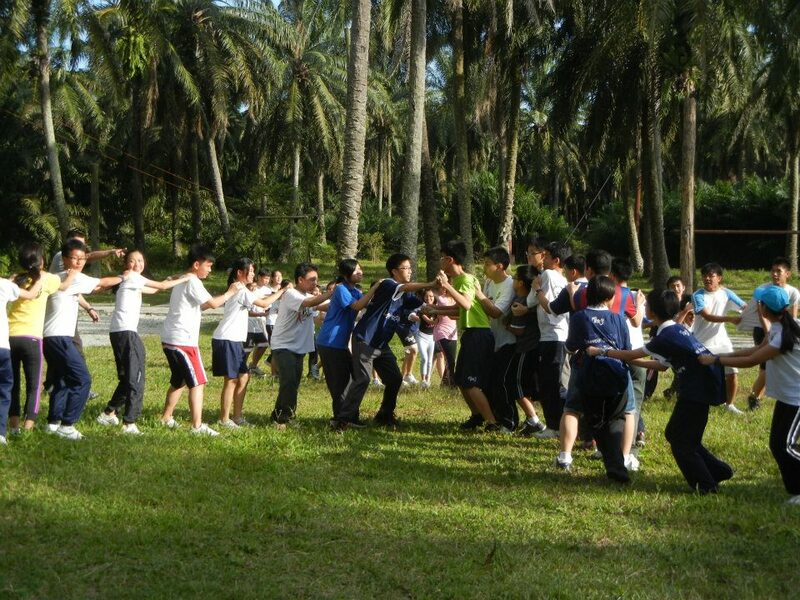 After that, we were split into teams. Mine is team Alpha, and what a ruckus it was. Yells galore, as if we were buying slaves, and it was a total muddle. We all have elected our leaders, and as usual, the seniors land the jobs. However, with the usual sarcastic twist, Major Chris simply tossed parcels at the juniors and pronounce them leaders. A lesson on the role reversal, it seems. Then, the ice-breaking games began. First, a game of coins warmed us up, with boys and girls grouping with each other in composite values. After that, each team formed dragons and tried to break the human link between the opposing team. Lastly, we played a game of burst pipes, in; in which we have to fill up the pipes to retrieve the ball within it. Soaked to the skin, that was what defined the moment. Even deeper, we learnt about how we both need noise and silence in communication. Head: What is A in Greek? Head: Why is it so awesome? After that, we went off for dinner duty. What an exhausting night. 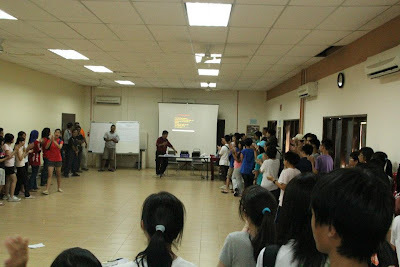 After dinner, we gathered in the hall. Major Chris taught us a thing or two about our master senses, and how cutting off one sense sharpens another. While I was clueless in finding my master eye (later I found out that I had none! ), he immediately called us out in the dark night. As the lights within the camp were switched off one by one, the stars became brighter, and I even managed to make out a few constellations! Anyways, we were paired up, and one by one we were sent in to the woods, like Hansel and Gretel tracing a path behind them, only we were a trail of glow sticks the coconut plantation was saturated with cricket chirps; the mirrors on the ground avoided and eyes sharply observing, the deceivingly dark surroundings. Even if a ring of diamonds is put on a rusty chain, it will only be as strong as the weakest link, a clichéd quote goes. However, it was true for our white elephant of or group. Even so, it was not all lost, as my ears pricked up at the slightest rustle of Major Chris’ gave us. He suddenly emerged from behind and heads us back to the now-blindingly-bright camp. I almost tripped at the drain because I was temporarily blinded by the fluorescent cafeteria. When we regrouped at the hall, we did some feedback, and thought about our previous assignment on choosing people to leave a nuclear bunker in an apocalyptic war-ravaged world; where we learnt of the different ways of reaching consensus. After been half- frightened to death by a peckish spider crawling beside me then we had supper, cleaned up and went to bed. It will be a long, but, day ahead…. What a day! Now, we’re having lunch under our dormitories. After a game of listening (which everyone got right, but with detrimental errors), it was time for adventurous cooking. Armed with two recipes, we headed off to our cooking area. Soup and bread was the name of the game, but then other ingredients were soon added (and some chocolate from our stash), so the recipe was largely abandoned. We were so excited that the food was everywhere. Soon, it got uber-chaotic and Colonel had to come to sort things out. Even so, the pancakes and eggs still was a disaster as the rice and chicken sluggishly boiled away in the bamboo and our potato and onion soup simmered to perfection. However, we managed to get everything done on time, and with the teachers’ approval. It is still funny remembering how we set the table on fire, as our parcel was stolen away. Even so, it was promptly returned and we even managed to overturn Colonel’s opinion that our ‘roti lilit’ was not an epic failure, as he had predicted. Well done, Team Alpha! More is done! 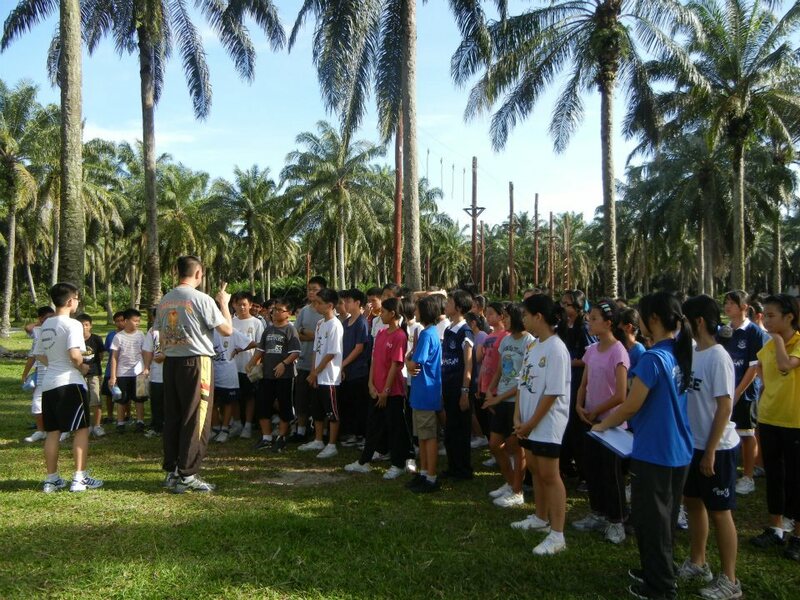 After lunch (apparently, other teams were starving), we had an explorace. It led us everywhere, but our lead was totally wrong from the third clue. With that, we ended up playing burst pipes thrice. Imagine how soaked we were! After all that, we watched other teams did the flying fox. How I wanted to do that! After a perilous game of see-saw, we ended up playing a game of slippers. My, how fun it was! Throwing slippers at one another is super-fun, whilst trying to restack the slippers without being caught, and super-exhausting, at least for me! We had an early night tonight. Now, we were supposed to have a campfire, but it didn’t seem that the weather would ever permit. With that, we had a performance. For our team, it was conceptually simple. A random bottle causes randomly awesome scenes when pressed, and the source for all the sorcery simply stemmed from our war cry. The most hilarious I’ve seen, was a sketch on how a team acquired an opposing teams parcel when they set a table on fire (which was what exactly what happened to us) and how they returned it to them; however it was plainly offending. Rants cast aside; I’m off to bed, waiting for morning to come. 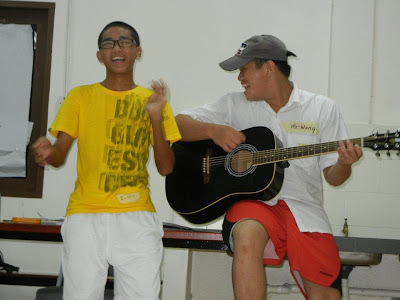 I can’t believe it is already the end of camp. Woke up in the morning, and found Major Chris smirking to himself. Then I remembered what he said yesterday: double dose of morning workout, that’s his prescription! We split up, and team Alpha and two other teams follow the facilitator and ran to the rock-climbing area. After warm-ups (shouldn’t warm-ups come before running? 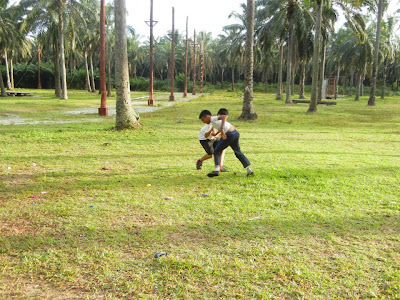 ), we started playing a game of catch, in which two opposing teams try to catch one another. We ran like there was no tomorrow, and how tired my legs were! 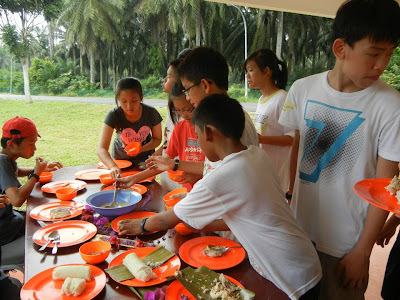 After a game of touch and cooling down, we darted to the canteen, and we darted to the canteen, and we had nasi lemak (okay, just coconut rice and anchovy sambal, but who cares!). Next, it was finally time to do some extreme activities. After the safety briefing, we were all hyped up; but when I got into the structure, I got petrified by the sheer height of it. I don’t know how but I managed to climb up the tall ladder. Don’t look down, that was my mojo. 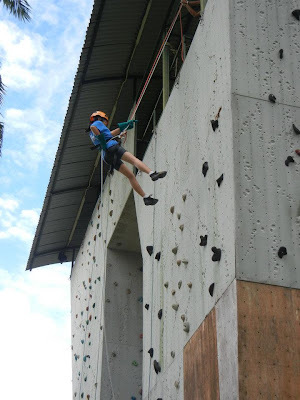 It must have been super-obvious that I have vertigo once I got up, because the facilitator teased me because of it! Sarcasm aside, I took a water balloon, got ready and I zipped away! Suddenly, I didn’t feel scared anymore, and I took aim and fired (way off target!). Landed with a crash, but unharmed. By then, I was so jumpy that I rushed back to the structure and put on my repelling gear and the rest of Team Alpha followed suit. We were so excited, that we lost our parcel, again to the same team! 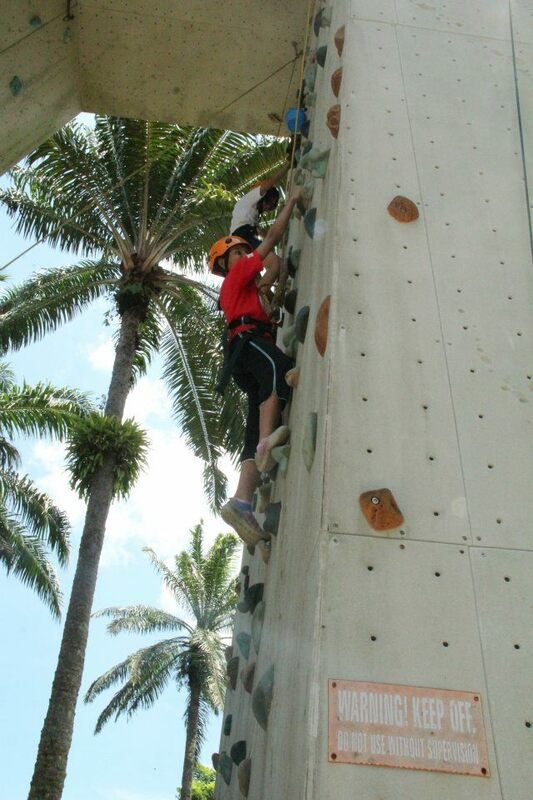 Anyway, once again, I got scared climbing up the ladder (with sarcastic remarks from the facilitator, again). Primed myself for repelling, and I just realized that I wasn’t falling to my death, which drove the vertigo out of me. 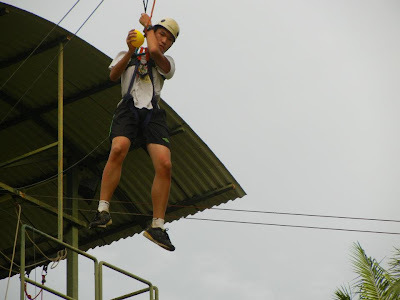 I jumped down perfectly, like how the facilitator demonstrated it, but then I just decided to free-fall! Exhilarating, that was what defined it. Finally, we got to play broken bridges, where we had to cross a pool of acid with only two planks. It was good fun arranging everyone and moving them like chess pieces, but we formulated our strategy too late, so we were overtime. 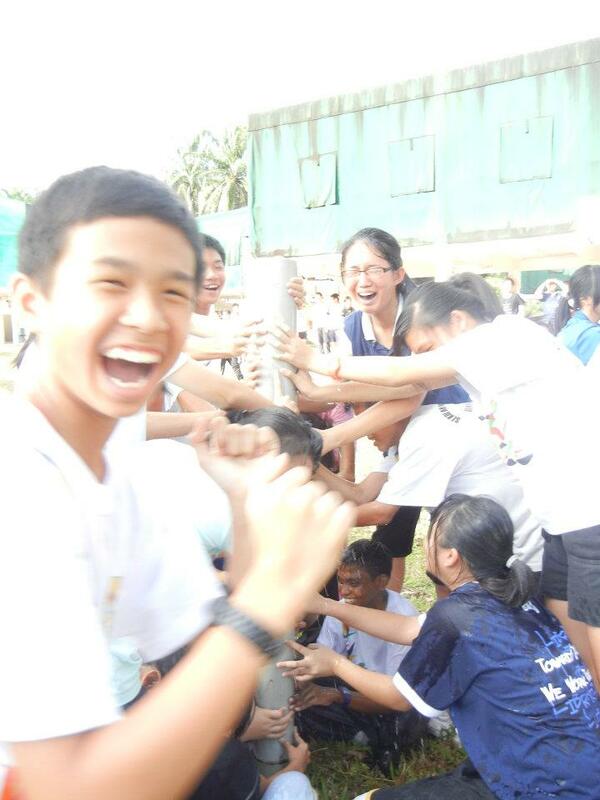 Then the facilitators started a water balloon bombardment, and we got all wet! 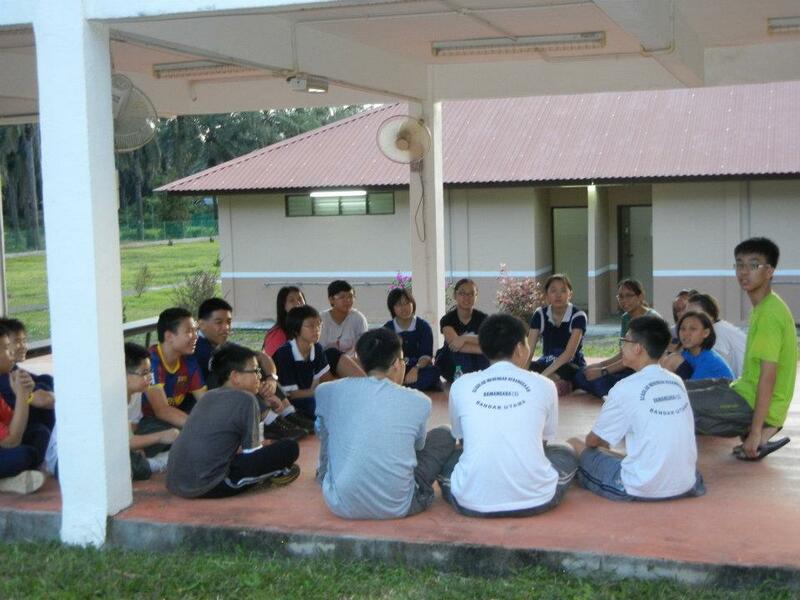 After a refreshing bath, and a delicious lunch of chicken rice, we gathered at the hall. After speeches of thanks and evaluations from all sides, the scores were finally revealed, and Team Alpha did quite well. The whole course ended with everyone singing along to ‘If We Hold On Together’. We then boarded our buses and waved goodbye to Major Chris. Finally at school! It has been such a fun trip, and I thought, as I waved goodbye to fellow campers, that it was a memorable experience that I would definitely cherish for life!